A recipe for growing & making Chinese cucumber pickles | Grow Your Own Veg Blog. Gardening and Food Blog. When I lived in Hong Kong and travelled to China on business trips, I was introduced to a kind of cucumber pickle salad that was always served cold during meals. In this dish, the cucumber slices were dressed in a delicious combination of garlic, vinegar and sesame oil that was so addictive I couldn't stop eating them. Now, every time I think of those crisp, juicy pieces of cucumber sitting in that garlic-ky vinegar, it sends my salivary glands into overdrive. 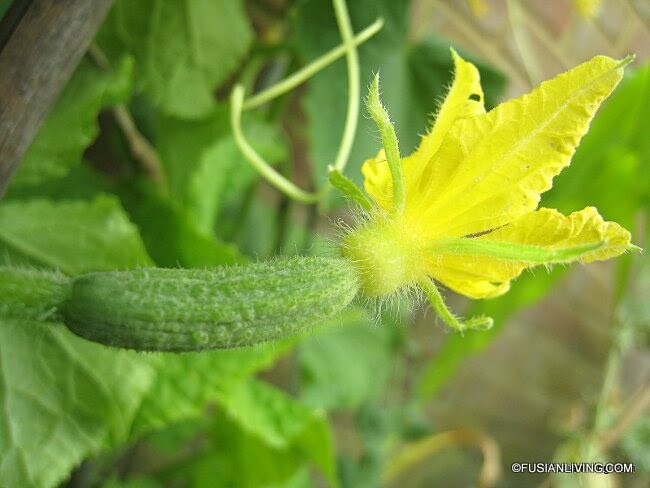 A few years later and now several thousands of miles away in the Chiltern foothills, I wander down to our kitchen garden, gleeful in anticipation of the young green cucumbers that I know are hanging from the vine. A quick flick of a sharp pen knife releases them and the slender, long fruits are soon laid out on a wooden chopping board ready to be cut up. With my chopsticks, I toss the crisp cucumber half rounds with sesame oil, garlic and rice vinegar - a perfect balance of cool and warmth. Light soy sauce brings saltiness to the dish and a smattering of finely diced chilli is added for a touch of heat. Combine the sesame oil, light soy sauce, rice vinegar, sugar, garlic and chilli. Place the cucumber into a bowl. Add the dressing and toss to combine. This pickle can be served with roast mackerel, grilled salmon or pork. If you are looking for rice vinegar, try Sainsbury's rice vinegar, which I used in this recipe. If you are growing your own cucumbers, pick them small while they are young and crisp. The more mature and larger cucumbers work better if you scoop out the watery seed content before using. Contrary to popular belief, you don't need a greenhouse to grow cucumbers and they can be successfully grown outdoors. Try 'Burpless Tasty Green' which is reliable and productive - I prefer to support the plants with canes to allow them to climb upwards keeping the cucumbers off the ground.